Sometimes I write about film. Those sometimes posts are here. A while back it was proposed in the comment area of a section of my analysis on Kubrick’s The Shining that the item Danny carries into the maze, when exploring it with Wendy, worn on a kind of holster, may not be a toy gun but is possibly a small super 8 film camera. Wendy is, herself, carrying a Polaroid camera. The analysis of “Day of the Fight” has been moved to the html portion of the website. NOTE: I’ve added an update at the bottom of the post. So, how does that reverse carpet trick work when Danny is in the hall on Wednesday and the ball rolls toward him? 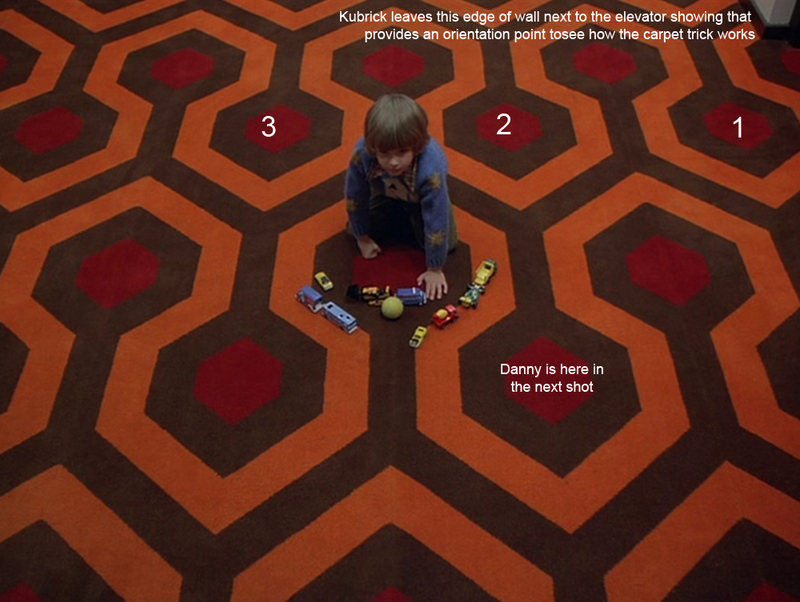 In shot 257, the camera is over Danny and facing him as the ball rolls to him on a “reversed” field of carpet, then in shot 258 the carpet is returned to its normal state. Kubrick has moved Danny. In shot 257 Kubrick leaves a bit of the edge of the white wall to the rear of the elevators showing which provides us with an orientation point. As you can see, based on that orientation point, in shot 258, Danny has made one diagonal move up. If this was a chess game it would be down the order of moving from D2 to C3. Not exactly, I’m just drawing a comparison to illustrate the manner of the move. What’s interesting to me is that Kubrick has left in shot 257 that orientation point of the bit of white wall so we can see what has happened. And now, viewing from the front again, in shot 259, we can look at that orientation point of the bit of white wall and see again how Danny has simply been moved. Comparing the above with shot 257 now that we know to look at the orientation point of that white corner. UPDATE (March, 2014): If there is any doubt this was done intentionally, such as that the very edge of the wall wasn’t intended to be viewed, please refer to my analysis of 2001, the Jupiter and Beyond the Infinite section. 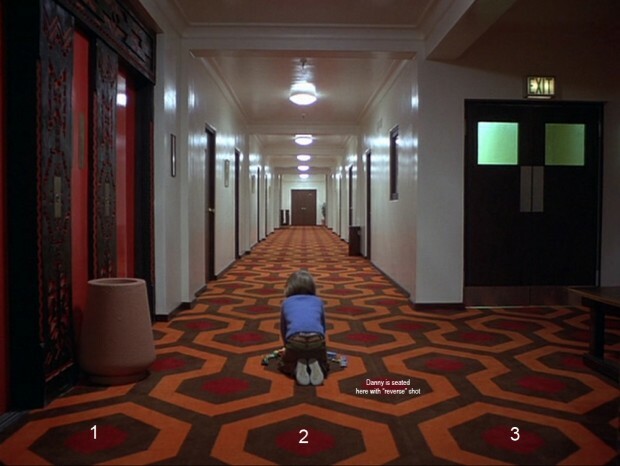 Kubrick does the same thing here with the illuminated floor, as you can see in shots 584 and 585. I’ve described this in the analysis (also in shot 590) and how I believe, in 2001, what he did fits in with the chess game between HAL and Frank Poole. To understand a little more about the chess game you’ll need to read section three of that analysis beginning at shot 264. 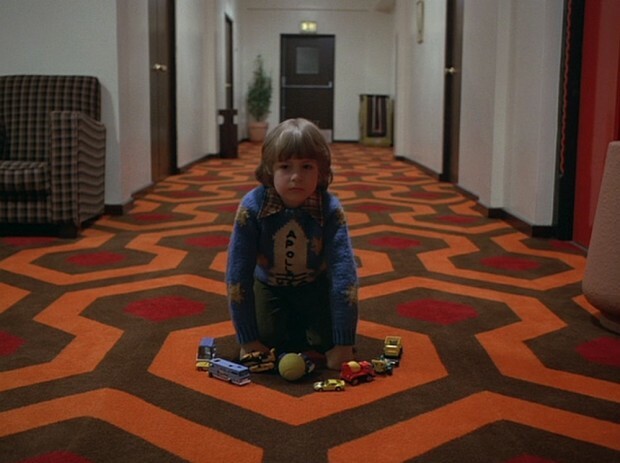 I had long thought that Kubrick’s moving Danny on the carpet seemed a very chess thing to do, but it wasn’t until doing my analysis of 2001 this past winter that I realized Kubrick had essentially the same set-up there and that Kubrick had established the chess board 8×8 square in shot 584. Part Eight post is here. Part Seven post is here. Part Six post is here. This post has been moved to to this page.